As the annual Run for the Roses draws near, we’re going to start taking a look at a variety of Kentucky Derby Contenders and favorites for the 2013 Kentucky Derby to be run at Churchill Downs on May 4. Several spots in the field are up for grabs as the new Derby points system susses out who makes the cut and who doesn’t. Well, points are awarded to the top four finishers of selected prep races. The point values increase as the season progresses, and the highest point totals at the end of said season will determine which 20 horses qualify for the Derby. With so much left to be decided, it’s a bit of a risk trying to peg the field – nobody knows exactly what’ll transpire over the next few weeks – but we’re going to press ahead and look at some of the colts we believe will meet the challenge. Today’s Kentucky Derby horse? One of the major players out of Bob Baffert’s camp – Power Broker. Power Broker’s a Kentucky native that was foaled in February of 2010. Trained by Baffert and ridden by Rafael Bejarano, he’s heading into a series of March and April prep races as one of the prohibitive favorites for Churchill Downs. With 10 points to his credit, Power Broker sits alongside the likes of Itsmyluckyday, Overanalyze, Uncaptured, Den’s Legacy, Super Ninety Nine, Will Take Charge, Falling Sky, Flashback, Revolutionary and Palace Malice as eighth overall in the standings. The big question facing Power Broker heading into May? Conditioning. 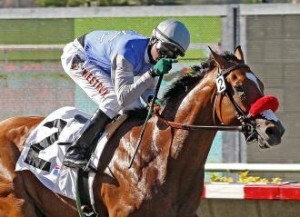 Baffert is on record saying the horse could stand to put on a little weight, which he has done with moderate success. The sticking points, though, are if Power Broker has put on the appropriate amount of weight, and has adjusted to a heavier carriage in competitive races. The latter could be an issue. Power Broker looks as though he’ll have only one start before the Derby – either the Sunland Park Derby March 24 or the Wood Memorial April 6. Will that be enough to get prepped for Churchill? That’s a big question facing Baffert and Bejarano. Power Broker’s body of work heading into the May 4 race has been spotty and sporadic at best, though there were some recent signs of positivity. Baffert sent out Power Broker – along with a number of his other stable powers – for a workout on February 25 at Santa Anita Park. To his credit, Broker performed well, much like he did during last year’s FrontRunner Stakes when he emerged the victor in an impressive performance. At Santa Anita, Power Broker completed four furlongs in 47 4/5, the seventh-fastest move of 42 at the distance.